Every morning hundreds of Sydneysiders rise well before daybreak to enjoy a pre-work surf or swim at one of our many beaches. But in the early 1900s, as surf-bathing (as it was then called) increased in popularity, so too did the number of restrictions imposed on beach-goers by lawmakers determined to maintain a strict level of moral decorum. This included a ban on ‘daylight bathing’ which required swimmers to leave the water by 7am, as well as restrictions on ‘mixed bathing’ which forbade men and women swimming together, although for safety reasons this stipulation was soon abandoned. The Sutherland Shire’s authorities were, however, particularly enthusiastic about policing additional beach regulations, in some cases many years after other local Council’s had bowed to public opinion through a distinct lack enforcement. • If they were in favour of allowing sunbaking, clad in costume, on the beach. • If so, whether the sexes should be permitted to sunbake indiscriminately together? • Whether sunbaking should be confined to sheds or special enclosures provided for the purpose? “In the sheds,” said Sutherland. Not only was sunbaking on beaches banned, but it was necessary for bathers to proceed to - and from - the water by the most direct route after changing in the specially erected dressing sheds. ‘Loitering’ was forbidden and offenders could face harsh fines. In 1920 Sutherland Shire Council took Herbert George Erickson to court for lying on the sand at Cronulla Beach wearing only his swimmers. The Propeller newspaper reported that Erickson had been ‘lying on the beach clad in his costume speaking to a young lady. They had an umbrella over them. He had surfed a good deal at times and at no other beach that he frequented were bathers prevented from lying on the beach while in a costume.’ For this heinous crime Erickson was fined 20/- and £1/1 professional costs in addition to 6/- costs in default of 14 days imprisonment. The health inspector said that shorts cost 3s, and that amount has to be deposited, and was refunded on return of the garment. “We now charge sixpence for a half-day and 1s for a full day for their hire,” he added. “Kimonos cost us 8s, and at a hire fee of sixpence each they have to be used 16 times to pay for themselves. When asked whether the garments were washed and disinfected after being used, the health inspector replied indignantly, “Certainly not. 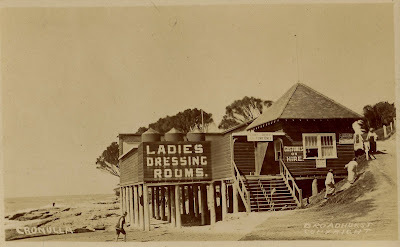 They are done once a week.” Shire President, Councillor Monro was, however, quick to correct this claim and assured the public that every bather hiring shorts was given a clean pair which had been treated in the most hygienic way. Nevertheless, many Sydney newspapers clearly took great joy in circulating articles and commentary on the scrupulous policing of Shire beaches. As far back as 1911 the St George Call published a letter from a ‘constant reader’ outlining his (rather tongue in cheek) recommendations for beach bathing rules. 1. You shall not bathe. 3. Notwithstanding anything contained in clause 2, any person bathing may be fined. be within 250 yards of the place where bathing in contemplated. 5. Each bather shall cause a man to walk, ringing a bell and carrying a red flag, not less than 20 yards in front of him.